If anyone could get you to write well, he could! Whether it’s reading his blog, his book Dare to Be a Great Writer, or just delving back into my old class notes, I know I’ll emerge stronger, more confident, and ready to take risks. For those who are writing and want a joyful boost or those who’ve wished away decades, this repost is for you! I hope you enjoy it. 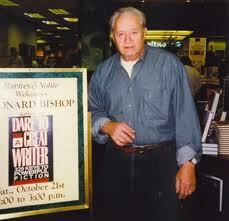 This entry was posted in Leonard Bishop, Teaching, Writing, Writing Process and tagged Dare To Be A Great Writer, fear of writing, How To Write a Novel, internal editor, Leonard Bishop, why should I write?, writing a novel, writing inspiration, writing techniques. Bookmark the permalink. 5 Responses to Get That Novel Going! Mr.B, a great writer, teacher, and friend! Truly miss him and bis writing class. Excellent reminder… time to “fire” the old editor and in with the new… I think even a bonus is in order!! Thank for the post! Hear, hear! For a good, positive internal editor!